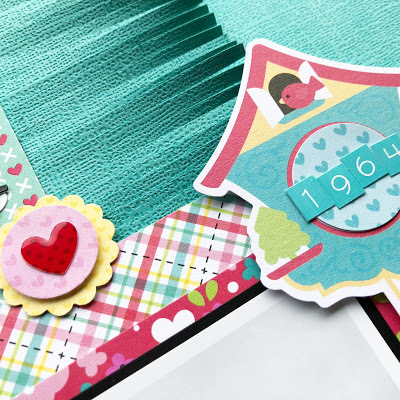 When creating a scrapbook layout using a photo dating back more than 50 years the natural inclination may be to look for some vintage-y patterned papers and embellishments. I suggest trying the opposite, lets combine bumblebee yellow, bubblegum pink and bright teal as a starting foundation! 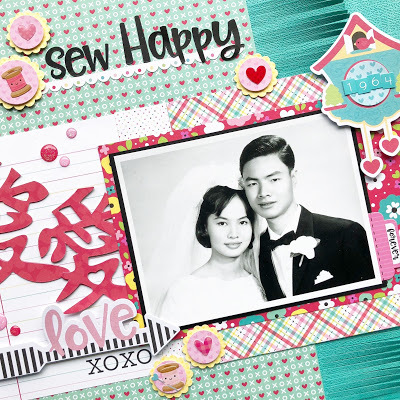 The pretty florals, plaids and hugs/kisses pattern papers from the So Punny collection work wonderfully with the black and white photo of my parent's wedding day. My mother had a successful career as a textile pattern maker so I thought the sewing references would be cute on the layout. On the right side of the page I wanted to include a subtle layer of texture and added a strip of fringed card stock in the same colour as the base. Kinda cool how the ends curl up a bit on their own. To the left of the photo I cut out the Chinese symbol for 'love' using my digital cutter. I cut out the character 3x from patterned paper and layered them all to achieve the thickness of thin chipboard. 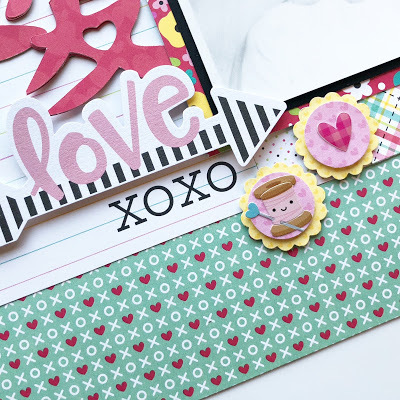 The patterned heart shape glossy sprinkles are absolutely adorable and I used them throughout the page on scalloped circles punched from the the hearts 6x6 papers. 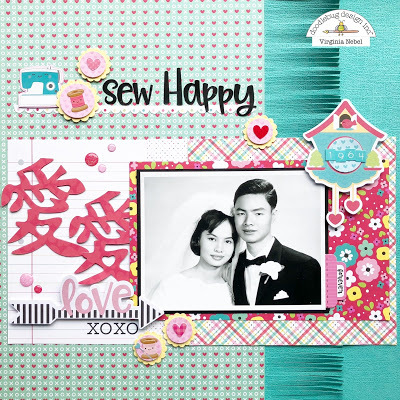 Hope this inspires you to create a love-themed layout. Have a wonderful day! Tis is such a beautiful layout!!! I love that fringe!! OMG What a Funtabulous Layout!! Your Punny idea sure is an Outstanding one!! Your Parents Wedding Photo is Positively Precious and the way you preserved the memory of this Special day is not only clever but ingious!! 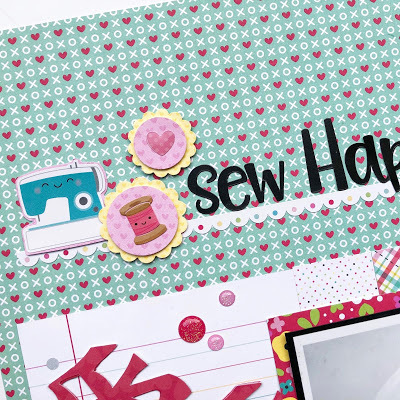 You definitely did a Super Incredible Scraptabulous Job!! YOU so ROCK! !